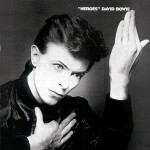 Heroes is the twelfth studio album by David Bowie, released in 1977. 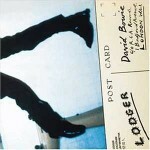 The second installment of his Berlin Trilogy with Brian Eno (the other releases being Low and Lodger) “Heroes” developed further the sound of Low. Of the three albums, it was the most befitting of the appellation “Berlin”, being the only one wholly recorded there. 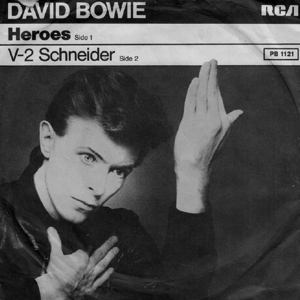 “”Heroes”” The track was not a huge hit in the UK or US at the time, but has gone on to become one of Bowie’s signature songs. In January 2016, following Bowie’s death, the song reached a new peak of number 12 in the UK Singles Chart. 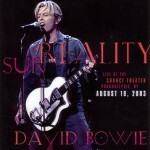 “”Heroes”” has been cited as Bowie’s second-most covered song after “Rebel Rebel”. Inspired by the sight of Bowie’s manager Tony Visconti embracing his girlfriend by the Berlin Wall, the song tells the story of two lovers, one from East and one from West Berlin. Bowie’s performance of “Heroes” on June 6, 1987 at the German Reichstag in West Berlin was considered a catalyst to the eventual fall of the Berlin Wall, similar to that of Bruce Springsteen’s concert at Radrennbahn Weissensee a year later. Following Bowie’s death in January 2016, the German government thanked Bowie for “helping to bring down the Wall”, adding “you are now among Heroes”. “”Heroes”” has received numerous accolades since its release, as seen with its inclusion on lists ranking the ‘greatest songs of all time’ compiled by the music publications; Rolling Stone named the song the 46th greatest ever, whilst NME named it the 5th greatest. Bowie scholar David Buckley has written that “Heroes” “is perhaps pop’s definitive statement of the potential triumph of the human spirit over adversity”. 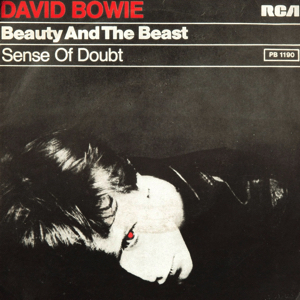 “Beauty and the Beast” was issued as the second single from the album in January 1978, becoming a minor UK hit, peaking at No. 39 on the UK Singles Chart. UNCUT: Widely seen as a more upbeat and positive album than Low. Is this accurate? DB: It’s louder and harder and played with more energy in a way. But lyrically it seems far more psychotic. By now I was living full time in Berlin so my own mood was good. Buoyant even. But those lyrics come from a nook in the unconscious. Still a lot of house cleaning going on I feel. UNCUT: The album was mostly written in the studio and completed in very quick takes. Correct? Was there an intent behind this method? DB: A couple were very definitely first and only takes. I think the rest were probably run at two or more times until the feel was right. With such great musicians the notes were neverin doubt so we looked at ‘feel’ as being the priority. Most of my vocals were first takes, some written as I sang. Most famously Joe the Lion I suppose. I would put the headphones on, stand at the mike, listen to a verse, jot down some key words that came into mind then take. Then I would repeat the same process for the next section etc. It was something that I learnt from working with Iggy and I thought a very effective way of breaking normality in the lyric. UNCUT: It is often said that the album sleeve was an allusion to Gramatte’s self-portrait or to Heckel’s Roquairol – is either of these correct? And did the Heckel painting also inspire Iggy’s The Idiot cover? DB: Heckel’s Roquairol and also his print from 1910 or thereabouts called Young Man was a major influence on me as a painter. I personally couldn’t stand Gramatte. He was wishy washy in my opinion. I have seen the Gramatte in question but no, it was Heckel. UNCUT: Is Blackout a reference to you collapsing in Berlin, or to the New York City power cut of 1977 – both of these? Neither? Blackout did indeed refer to power cuts. I can’t in all honesty say that it was the NY one, though it is entirely likely that that image locked itself in my head. UNCUT: V2 Schneider – a tribute to Florian? Charles Shaar Murray: Why does Heroes – or more accurately “Heroes” come in quotes? Are the inverted commas actually part of the title? DB: Yeah. Firstly – it was quite a silly point really – I thought I’d pick on the only narrative song to use as the title. It was arbitrary, really, because there’s no concept to the album. CSM: I’d felt that the use of quotes indicate a dimension of irony about the word “Heroes” or about the whole concept of heroism. DB: Well, in that example they were, on that title track. The situation that sparked off the whole thing was – I thought – highly ironic. There’s a wall by the studio – the album having been recorded at Hansa by the Wall in West Berlin – about there. It’s about twenty or thirty meters away from the studio and the control room looks out onto it. There’s a turret on top of the wall where the guards sit and during the course of lunch break every day, a boy and girl would meet out there and carry on. They were obviously having an affair. And I thought of all the places to meet in Berlin, why pick a bench underneath a guard turret on the wall? They’d come from different directions and always meet there… Oh, they were both from the west, but they had always met right there. And I – using license – presumed that they were feeling somewhat guilty about this affair and so they had imposed this restriction on themselves, thereby giving themselves an excuse for their heroic act. I used this as a basis… therefore it is ironic. Yes it is. You’re perfectly right about that, but there was no reason why the album should have been called “Heroes”. It could have been called “the sons of silent ages”. It was just a collection of stuff that I and Eno and Fripp had put together. Some of the stuff that was left off was very amusing, but this was the best of the batch, the stuff that knocked us out. CSM: Do you find that recording in a studio that’s right by the Berlin Wall gives you a sense of being on the edge of something? DB: That’s exactly right. I find that I have to put myself in those situations to produce any reasonable good writing. I’ve still got that same thing about when I get to a country or a situation and I have to put myself on a dangerous level, whether emotionally or mentally or physically, and it resolves in things like that: living in Berlin leading what is quite a spartan life for a person of my means, and in forcing myself to live according to the restrictions of that city. Q. How did the rest of the finished album strike you? ENO: He gets into a very peculiar state when he’s working. He doesn’t eat. It used to strike me as very paradoxical that two comparatively well-known people would be staggering home at six in the morning, and he’d break a raw egg into his mouth and that was his food for the day, virtually. Q. Do you have much in common in terms of approach? Oblique Strategies subtitled Over One Hundred Worthwhile Dilemmas is a deck of oracle cards which Eno developed and published with his painter friend Peter Schmidt. It is modelled philosophically on the ancient Chinese I Ching or Book of Changes. Eno had taken to formulating aphorisms as aids to the creative process. Each terse proverb was designed to frame a work-in-progress in a fresh perspective when the artist got bogged down in details, unable to maintain a sense of creative options. Eno wrote down his aphorisms on cards and placed them in various locations around the recording studio. Random selection of a card and reflection on its message often provided fresh and unexpected resolution of a musical quandary.